Dr R Rukkumani, a faculty in the Department of Biochemistry and Molecular Biology of Pondicherry University, received the prestigious ‘Woman Scientist Award’ by Biotechnology Research Society of India (BRSI). 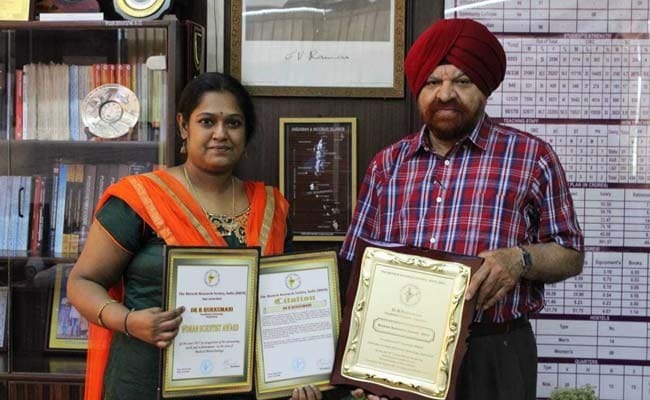 Vice Chancellor of Pondicherry University, Prof. Gurmeet Singh appreciated Dr Rukkumani for her achievement. Among several nominations from different Universities, Research Institutes and Industries, she has been chosen for the award. The award includes, certificate, shield, citation and a cash prize of Rs. 25,000/-. The award was given to her in the recently held 15th BRSI Convention and the International conference on Innovation for Bio Sustainable development held in Hyderabad. The award was presented to her by the Director General of CSIR, Prof Shekhar C Mande in the presence of Directors of seven CSIR Research institutes. Dr. Rukkumani has been working in the field of cancer Biology and her Molecular Medicine Research laboratory constantly works to find efficient therapeutics for cancer. She has identified an efficient anticancer molecule from a natural source and has filed a patent for the same, said a statement from the University. She is working on drug repurposing and nano targeted therapies for treating metastatic cancer. She has also received awards like ‘Scientific excellence- Senior award’ by Biozone Research Technologies and ‘Outstanding Women in Science award’ by Centre for Advanced Research and Design, Venus International foundation, Renato Dulbecco Memorial Award by II World Cancer Congress and ‘Best Teacher award’ from Pondicherry University the year 2018 . She has published more than 60 International research papers and has obtained five projects from various funding agencies on Cancer.